There's nothing like the sizzle of the grill, filling the backyard with festive feelings and smoky, delicious scents and flavours. Here's how to make your barbecued feast healthier, and cook it up like a pro. It’s a feeling most of us know well – balmy nights, a backyard full of smoky scents and flavours, the delicious sound of the grill sizzling. It’s a classic Australian experience, bringing people together in a warm and festive atmosphere. A barbecue might feel like a party, but it doesn’t have to be a big indulgence. Themis Chryssidis, Accredited Practising Dietitian and spokesperson for the Dietitians Association of Australia, says there are plenty of ways to make your feast healthier. There’s one big key: vegetables. “For me barbecues are about variety, but that shouldn’t just be a variety of different types of meat. We need to think outside the square a little more,” Themis says. To put together the perfect barbecue, we asked Themis and Jamie for their best advice. It’s the barbecue classic – sizzling steaks and burgers. Choosing leaner cuts of meat, and trimming off the excess fat, is an easy way to make your feast healthier. As a bonus, it also reduces the chance of flare ups on the barbecue. Look for choice or select grades of beef, and choose loin or round cuts of red meat and pork. "Of course, things like porterhouse steak or fillets can come at a higher cost. We can get around that by making sure we only have small portions – so a 100 g serve, not a 300 g rib eye,” Themis says. 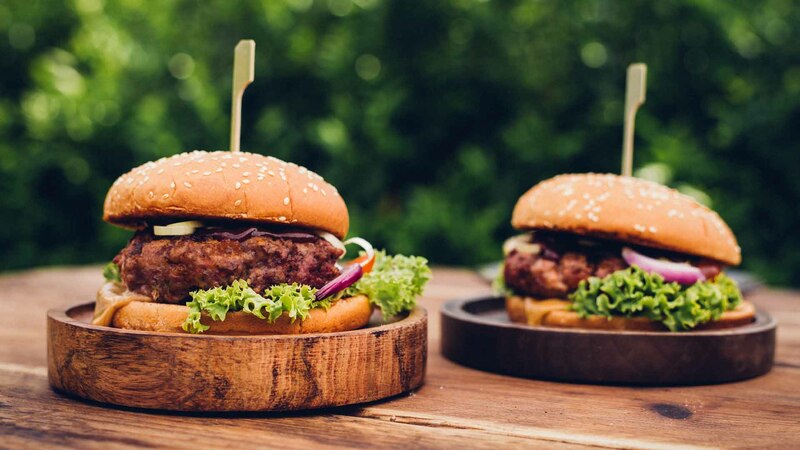 If you love burgers, a good option is to buy extra lean ground beef (or chicken, turkey or legumes like chickpeas and lentils) and make your own. It’s easier than you think, and they’re likely to be healthier than many pre-made patties. For deliciously juicy burgers, Jamie advises cooking with the barbecue lid down. “This reflects heat onto the top of each patty, meaning the burgers are cooking on both sides,” he says. Choose breast meat over the fattier dark meat (legs and thighs). A good trick is to remove the skin first – the skin soaks up all the juices and fat while it’s cooking. Boneless pieces will be thin enough to grill over direct heat. But pieces with bones take longer to cook, so you’ll need both direct and indirect heat. “Otherwise, the surface will burn to a crisp before the meat at the bones has lost its pink colour,” Jamie says. To prevent flare-ups, it’s usually best to begin with indirect heat. This is particularly true for cooking wings. “The wingtip has almost no meat, so just cut it off before grilling,” Jamie adds. Fish and smoky flavour were made for each other. Grill up a side of salmon, mackerel, trout or herring, flavour it with lemon, dill and pepper, and you’ve got yourself a feast. Fish is a rich source of omega-3 fatty acids, which can help support your heart health, brain function and mental health. Don’t forget seafood – throw together some barbecued prawns with salsa verde, or treat yourself to fresh calamari with chilli and lime. To avoid fish sticking to the grate, Jamie suggests brushing the fillets evenly with oil before cooking. “But don’t overdo it," he says. "If the fish is dripping with oil, you will probably get flare-ups." Try a simple marinade of olive oil, balsamic vinegar and a little salt and crushed black pepper – it goes deliciously with mushrooms, pumpkin or eggplant. Fill up your plate, or get some skewers and make colourful vegetable kebabs. Choose thicker spears of asparagus, which tend to have more flavour and are ideal for the grill. “Peel the bottom two inches with a vegetable peeler to ensure even cooking,” Jamie says. A good barbecue can be every bit as delicious for vegetarians. You can get plenty of different tasty veggie burgers and sausages at the supermarket, made with filling ingredients like chickpeas, lentils, soybeans and sweet potato. Or you could grill up some marinated tofu, slices of haloumi, or big Portobello mushrooms, eggplant or pumpkin. There are lots of ways to get juicy texture and flavour, so everyone can enjoy the feast. Simple ingredients like olive oil, mustard, lemon juice and fresh herbs and spices can give you incredible flavour, without all the extra salt, sugar and fat often found in bottled sauces. “Try to make marinades yourself, because that’s the best way to control the amount of salt and sugar you’re putting into it,” Themis says. “A simple marinade of balsamic vinegar and olive oil works really well. “Dry spice rubs, with spices like cumin, coriander and smoked paprika, are another good option for nice toasty flavour. You can also make some beautiful herb condiments, like sauces with fresh herbs and capers and little pickles. Yoghurt and olive oil with a little pinch of salt and some lemon zest is a great little condiment to have with meat." Marinades are best used with foods that cook quickly, like vegetables – otherwise you risk it burning. This is especially true for marinades that contain sugar or honey, like many Asian-style combinations. To marinate meat, brush it gently to lock in moisture and smoky flavour, and drain off any excess before cooking. 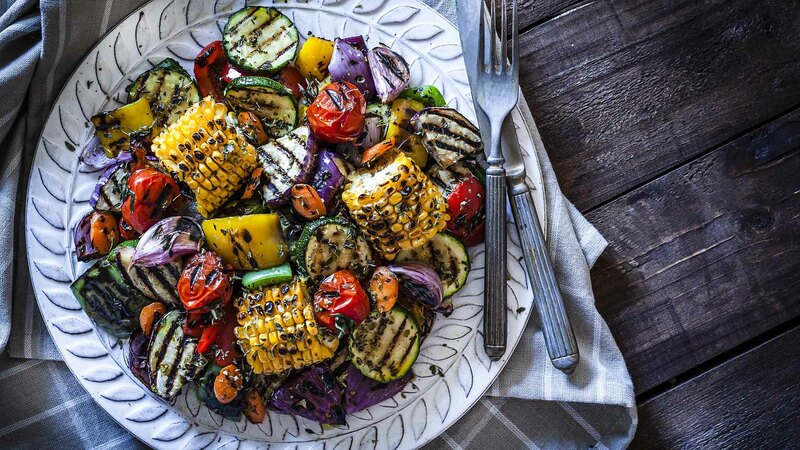 Finally, freshen up your barbecue with colourful salads. Take some leafy greens and get creative with ingredients like almonds, strawberries, blueberries, chickpeas, brown rice, quinoa, low-fat feta and lots of fresh or roasted veggies. For some nutritious sides, try sweet potato chips, grilled corn on the cob, spicy couscous and wholegrain, seeded breads. Swap the soft drink and beer for a refreshing beverage of sparkling water flavoured with lemon and lime. And for a naturally sweet dessert, try grilling fruits like sliced pineapple, nectarines, plums and peaches – the sugars caramelise with the heat, bringing out a delectable flavour. Jamie Purviance’s latest cookbook, Weber’s Greatest Hits, is published by Murdoch Books and available now.